At the announcement that Jesus would be born, at his birth, and then again at his crucifixion, Mary of Nazareth is a central figure. Indeed, though she has become almost invisible to many Protestants today, she was clearly the most important woman in the life of Jesus. The doctrine of the Incarnation—accepted by Protestants as by all Christians—reminds us just how important. During the years of her son’s ministry, however, Mary recedes into the background. Between Mary’s losing—and—finding of Jesus as a boy at the Temple and the scene of her son’s Crucifixion, she appears only twice: at the wedding at Cana (John 2:1—10) and at the teaching of the multitudes (Matthew 12:46–47; Mark 3:31; Luke 8:19). These Biblical narratives are the only canonical witnesses to Mary’s whereabouts during this period, and they offer only brief sightings of her. At this point in the Bible narrative when Mary is seemingly most invisible, however, we still find her continuing to play an indispensable role. Throughout his ministry, Jesus functioned as a teacher in a classroom without walls. “Teacher, we wish to see a sign from you,” the scribes and Pharisees remarked in Matthew 12:38. Jesus refrained from giving them a decisive sign of his identity at this time. Rather, he taught with parables and with visuals. He taught by healing a person with a withered hand, by curing another who was blind and mute, by stilling a storm. He used familiar, everyday things in his teachings: a lamp under a jar, a sower and some seeds, a tree and its fruit, weeds among wheat. Jesus was a mesmerizing Rabboni. How did he develop this compelling, down-to-earth style of teaching? In meditating on this question—and the larger issues related to Jesus’ humanity (for example, What did he know and when did he know it? )—some have dwelt on Mary’s role as Jesus’ first teacher. Rembrandt depicts Mary leaning over the crib of the infant Jesus with a copy of the Torah in her hand (facing page). A 15th-century engraving titled “The Holy Family on the Way to School"(above) shows Mary holding Jesus’ hand as he carries a tablet with the words, “I am Jesus, Holy One, Savior.” Tellingly, Joseph walks in the background, but it is Mary who pulls Jesus along to school, perhaps to the synagogue. Jesus may have learned carpentry skills from Joseph, but it is reasonable to think that he learned some things about teaching from Mary, as well as from the rabbis in the local synagogue and in the Jerusalem temple. After he “grew in wisdom and stature,” Jesus left the care of his mother, as did all young Jewish men. Yet he did travel with her at times—to the wedding at Cana, for example. Mary was the primary invited guest at the celebration, but “Jesus and the disciples had also been invited” (John 2:2). And this became a teaching moment for Jesus, with Mary serving as a catalyst or a prompter. Mary obviously knew Jesus was teaching, even through this curt response. She also knew something else was about to happen, because she commanded the servants of the bride and bridegroom: “Do whatever he tells you.” Jesus asked the servants to fill six stone jars with water. Upon drawing out the liquid, the steward declared the new wine to be better than the previous. Mary’s importance in the scene was this: she served as a go-between or mediator to her son, on behalf of a needy people. Some Christians continue to view Mary today as a mediator (or, using the feminine, “mediatrix")—an intercessor between Christ and humankind. For these believers, Mary is an advocate for people’s needs today, just as she was in Cana of Galilee. They see her in the cloud of witnesses mentioned in Hebrews 12:1–2, encouraging Christians to continue in the race set before them. Some traditions place her in a special category among the cloud of witnesses and pray directly to her. All children are embarrassed with their parents at some point in their development. When Jesus’ mother and brothers came to him as he taught the crowds, he did not claim them as family. Rather, he said: “My mother and brothers [and sisters] are those who hear the word of God and do it” (Luke 8:19; Mark 3:31; Matthew 12:46–47). Was Jesus trying to disassociate from them? Once again, Jesus the Teacher is offering a lesson that is at the heart of the gospel message. Jesus is inviting those who hear and do the word of God to become members of a newly constructed family. This family is constituted through God’s gracious adoption of those of us who accept Jesus as Firstborn of this family. The Holy Spirit is the guarantee of our inheritance. We are adopted as sons and daughters of God. In some ways, Mary was used as a foil or as a prompt for Jesus to introduce this new image of family. Biological children had always been the norm for family. In the Hebrew Scriptures, having children was a type of resurrection. Childlessness or barrenness was a curse and a type of death. From the Cross, Jesus connected Mary and John as mother and son. This was another visual aid to illustrate a new kind of family—the spiritual family that Jesus was birthing through his death. Educators know today that there are different types of learners: visual, auditory, kinesthetic, tactile. We witness Jesus, perhaps out of his experience learning at the knee of his physical mother, Mary, reaching out to all forms of learners to help them understand these life-changing truths. To put in context the absence of “mother” language in the book of Ephesians, we must remember how the cult of the Great Mother dominated religious devotion in the Mediterranean area before and during the time of Christ. One manifestation was the worship of Artemis, the many-breasted goddess, mentioned in the book of Acts. Paul himself was accused of interfering with Artemis worship. It is probable that the absence of the feminine dimension in Ephesians’ “family of faith,” for example, is an attempt to uplift the Great Father (Ephesians 3:14) from whom every family comes. 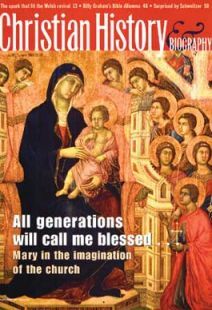 It is reasonable to believe that as 1st-century Christians reacted to the Mediterranean cult of the Great Mother, they downplayed the role of the mother of Jesus. Her importance as the mother of God was certainly a “given” to 1st-century Christians. And later believers continued to meditate and expand upon her role, placing her at the center of the disciples—eventually, in an exalted role as symbol and epitome of the church—even where Scripture was silent. Jeanne Stevenson-Moessner is associate professor of pastoral theology and Christian formation at The University of Dubuque Theological Seminary (PCUSA) in Dubuque, Iowa.